My friends and I have recently got back into the sports groove with the newest edition of the boardgame/videogame Blood Bowl. 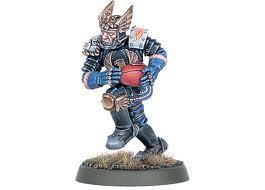 Before I get too far have a peek at this old post I made about Greyhawk Rugby; that's what Blood Bowl should be all about: a mix of fantasy and modern sports. Below is a list of team names for a Greyhawk themed tweak of my inter-college Rugby League campaign, instead cast as a regional league more along the lines of the multi-racial Blood Bowl game. Human: "Free City of Greyhawk Griffons"
The city has a lesser collegiate league still and their best athletes compete abroad. The Free City Arena is still the best venue to play in all the central lands. The Orcish Empire of the Pomarj likely has many teams, however this lair of humanoids in the Gnarley Forest is much closer to the action. Only the league keeps them relatively peaceful. Greysmere is one of three dwarven teams out of the Abbor Alz Mountains. There is no Skaven race per se in Greyhawk so this is a team of vile wererats hailing from the sewers of Greyhawk. Celene may currently be isolationist but the fringes elven communities still have contact and interaction with other realms, including this one on the edge of the Wild Coast. 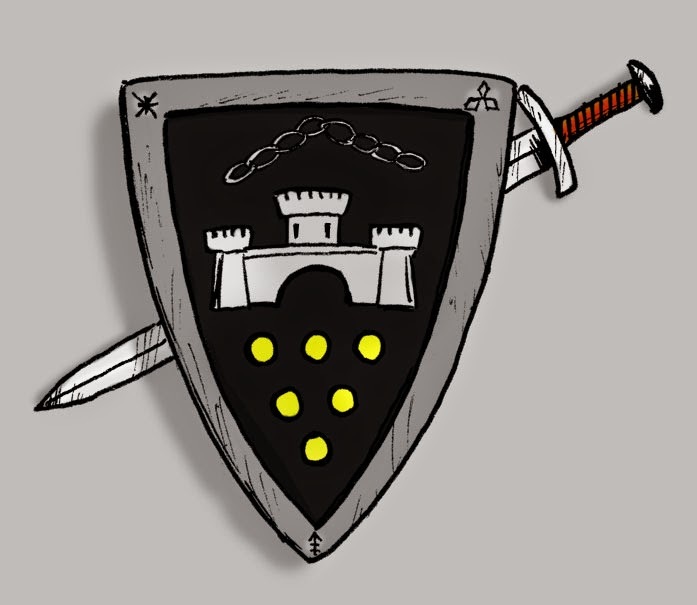 Bretonian: "Free City of Dyvers Bannermen"
Dyvers' rivalry with the Gem of the Flanaess continues in this league. Their history as the former capital of the Kingdom of Furyondy lives on in their team name. This very short and soft team is more interested in the festivities and post game meals than the game itself. This group of goblins in the Cairn Hills gets out to compete just to show their orcish masters they can't be pushed around. This group of mysteriously mutated men have come out of the Wild Coast to bring the pain. The Despotrix of Hardby has assembled the toughest, roughest women in the domain to be on her all-female squad. Emerging from the swamp is an amazingly capable set of lizardmen athletes. Who knew they had talent? This dreadful team just started showing up. The Ghost Tower continues to surprise. Wood Elf: "Clan Meldarin Archers"
Another remote elven team from the Gnarley. They compete just because they don't want the high elves to get all the glory. Apparently the famous ruins has issued out some skeletal players ready to compete, but who is the manager? Today I'm brainstorming a different subject for my rambling development of the Dry Steppes and an associated megadungeon. I was looking at the regional encounter charts in the Glossography book of the World of Greyhawk setting boxed set and noticed the steppes are woefully boring. Most entries for nations or geographical areas will have a list of typical races or creatures you'd already expect to find randomly, then the chart will end with half the results being "Use Standard Encounter Tables". This is fine because half the time you will see common things like men, dwarves and orcs. Only rarely do you bump into manticores or owlbears and stuff. The Wastelands section is no different except most of these areas have at least one distinctive entry. This is typical for these encounter charts; you will see lots of humans and occasionally a special critter, in this case the Pernicon, which is a very nasty giant grasshopper from Fiend Folio that latches onto you and drains fluids in the form of constitution points. Oh, by the way in their lair you can encounter 300-3000 of them! Not to digress, the other wastelands have critters too. The Land of Black Ice has literally only one encounter before standard ones, the infamous Blue Bugbear. Not as scary as a pernicon but it's unique. Riftcanyon is also heavy of Men and Humanoids but it at least has a 3% chance for Ogres. The Sea of Dust is the best and most diverse. There is no "standard chart" for this desert. As a result you get more than just roving men. You get boring beetles, scorpions, snakes and spiders. It also has some of the nastiest Fiend Folio creatures like Osquips, Firenewts, Thoqqua, Jermlaine, Dune Stalkers and also yes, Pernicons. The Dry Steppes entry however, has only one special creature on its list: Horses. Well that's wonderfully bland, unless your characters train animals. Now I realize the steppes aren't as dangerous and inhospitable as the Sea of Dust, but by trying to make a more fully realized wilderness encounter chart, I want to add a bit of color to make the Dry Steppes more distinctive than "where wild horses come from." Drawing ideas from neighboring charts is a bit of help, but we are talking mountains at this point. Ull and the Plains of the Paynims is all nomads, the Crystalmists yields plenty of Giants or their kin, which we learn from Against the Giants, Greyhawk Wars and Liberation of Geoff, are more interested in bashing the fertile east. The south bordering Sulhaut Mountains are intriguing though. Demihumans (Dwarves? Gnomes? What? ), Drow (night only), more Giants and Humanoids and the curious Pleistocine subchart. Talk about dangerous, you have to go through all that to get into the Sea of Dust! Most mountain critters aren't going to venture out on the steppes though, except as we've seen, Giants. What if, the realms of the Sheldomar Valley rally and repelled all the giants so their only option is to raid westward? Plenty of horses to eat! Or perhaps something more sinister is afoot like the Drow are manipulating monster incursions into the nomad's territory. Or maybe all this list needs is a special monster from the Fiend Folio that hasn't been used already. Let's see...how about Clubneks? 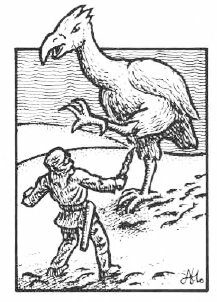 Giant, mutated, killer ostriches? Check mark! I could go on forever, so that's enough for now. Thanks for reading. 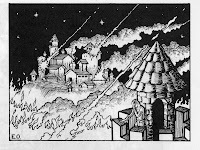 Lately I've been musing over the need for some new megadungeons in Greyhawk. The ones we have are classic and have been revised, returned to and played out for the most part. My personal stab at this is a proposed megadungeon set in the Dry Steppes. The Dry Steppes is a remote, undeveloped area with ancient historical background. For my own amusement this hypothetical dungeon is also set very close to the southern border of Ull, a land that no one knows better than myself. Without further ado, I introduce Qabu Al-Imbraturi "The Vault of the Emperor". The location of Qabu Al-Imbraturi was lost to memory since the Invoked Devastation ravaged the Baklunish Empire, thus ending their long war with the mutually annihilated Suloise Imperium. Nomads of the Dry Steppes had traveled in the shadow of this ruin for generations without ever knowing of its existence, until recently, when it appeared following a brief display of strange lights in the night sky. The upper ruins of this ancient edifice is carved into the side of a mountain while deep below, vast armories and arcane foundries are said to house the most destructive weapons ever crafted by the Baklunish. Sages speculate that escalating warfare upon the Fields of Padyr to the south and grim portents concerning the Suel Mages of Power, forced the Padishah to pour massive manpower and resources into the creation of the Vault. What mighty artifacts and relics were created here is unknown, but surely great elemental magics must be contained here; possibly a precursor to the infamous Rain of Colorless Fire. At first the ruin's appearance was a curiosity for superstitious nomads; deemed either a holy site or a cursed domain. Before long the lure of treasure and magic attracted less scrupulous foreigners. Based out of the nearby town of Kester, teams of highly competitive explorers have begun to pierce the upper dungeon, after first contending with the natural dangers of the steppes. The full extent of Qabu Al-Imbraturi has yet to be determined due to vicious traps and ancient wards still in place. The lethality of the dungeon has led some parties to share their knowledge in order to make further progress. Despite the risk, it's only a matter of time before some bold, resourceful adventurers discover how to penetrate the deeper levels of the Vault of the Emperor. #1 Queen Yolande of Celene at 27% was most popular. Not only is she elven but this is the only female on the list. It shows some of us are ready for a female ruler, although if I threw Countess Belissica of Urnst on the poll, I bet that vote would've got split! #2 King Kimbertos of Keoland is a no-brainer with 24% of the vote. The Sheldomar Valley is quite popular in the Greyhawk community and it helps he is a powerful ranger. Imagine a King Aragorn post-War of the Rings. Who wouldn't like him to be king? #3 King Belvor IV of Furyondy at 16% is another fan fave. He is not only lawful good, but his nation is on the front lines of the war against the ultimate evil, Iuz. This casts him more in the role of a Lord of the Rings type of ruler than Kimbertos. What has Kimbertos had to worry about? Giants? 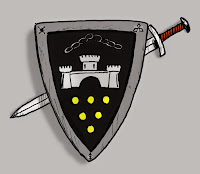 #4 Lord Mayor Nerof Gasgal of Greyhawk came in at 12% of the vote narrowly beating Ivid V. For being the ruler of the Gem of the Flanaess, the settings' core city and driver of adventure, I am surprised he didn't do better. Then again, Nerof is a former thief whose election to the head of the city is dubious. I can see maybe, why monarchs are more romantic in this list. #5 Overking Ivid V of the Great Kingdom came in with 11% narrowly beat by Greyhawk's mayor. The Great Kingdom is evil overall, but Ivid does have some qualities worth picking him. He has power hungry madness, undead appeal, fiendish guards and a relic throne. I hear in the Great Kingdom he is polling at 95%. Here is the first look at a map I've been working on, based on the Dry Steppes map in Vecna Lives! by Steve Beck. I also draw inspiration from Anna Meyer's regional maps, which include references from Gygax's Gord novels. I also threw in some of my own "Morthawk" which is the real reason for my interest in remaking this intriguing map. I'll elaborate more in the coming weeks. Enjoy!